Supergirl’s ratings have been up and down during the drama’s first season. Some weeks have gone much differently than others, and we now know that adding Barry Allen into the mix was certainly a good idea. This morning, the ratings are in, and it looks like well over a million additional viewers showed up to watch the crossover episode live. Yes, more than a million. Last week, Supergirl only pulled in 6 million total viewers in Live+ Same Day ratings. However, this week’s episode “World’s Finest,” actually brought in 7.24 total viewers, up 1.24 million from last week. That’s an impressive increase in total numbers and it’s even more impressive in the 18-49 ratings demographic. TV By The Numbers report shows a 1.7 rating for the episode, which equates to a 31% increase in viewers in the demo. Obviously, there was a lot of hype surrounding the team-up. 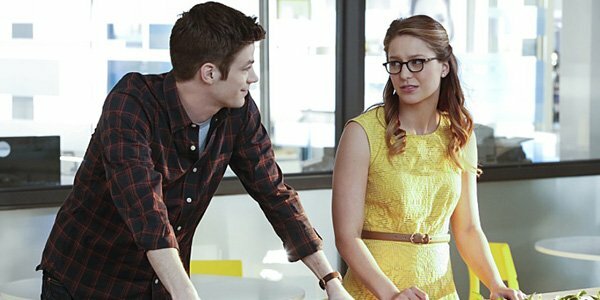 Plus, the novelty of the team-up likely brought in a few viewers who were curious about how Flash and Supergirl could end up in the same world. Some of those viewers may have been Flash fans who wanted to see the episode of Supergirl to keep up with their own series. Some of them may have also been Supergirl fans who decided to tune in live for the exciting episode rather than waiting to catch it on their DVRs. Either way, the episode translated into good numbers for Supergirl during a time when Supergirl could use some good numbers. While the drama has seen its total viewership hold steady over the last several months, CBS hasn’t come out of the woodwork yet to actually renew Supergirl for Season 2 (although a lot of CBS favorites have gotten greenlighted for next season). Because Supergirl has a younger audience average than a lot of CBS’ shows, we do widely expect the renewal order to come at some point. Still, a sharp increase in the numbers always helps, especially because it bumps up the overall ratings average for the show during Season 1. While there are some problems with trying to get the likes of Flash, Supergirl (and potentially even Arrow or the Legends of Tomorrow characters) into the same world, the positive ratings upswing could be a viable reason for both networks to put together an episode like "World's Finest" in the future. But first Supergirl obviously needs to be renewed. We'll let you know if and when that happens. In the meantime, new episodes of CBS' Supergirl air on Monday nights at 8 p.m. ET. In addition, if you'd like to know what CBS and the other networks and streaming services have coming up this summer, you can check out our summer TV premiere schedule.